Smartphone technology has changed the way that we can measure health and fitness and provides great tools to help us improve all aspects of wellness. There are a huge number of pieces of equipment available, such as Bluetooth-capable fitness bands and WIFI-enabled weighing scales, as well as Apps and Websites that allow you to record data on your food intake and exercise. Used together these tools can help anyone improve their health and fitness. In this post I show some of the items I use personally and that I believe have contributed significantly to my own health & fitness journey. 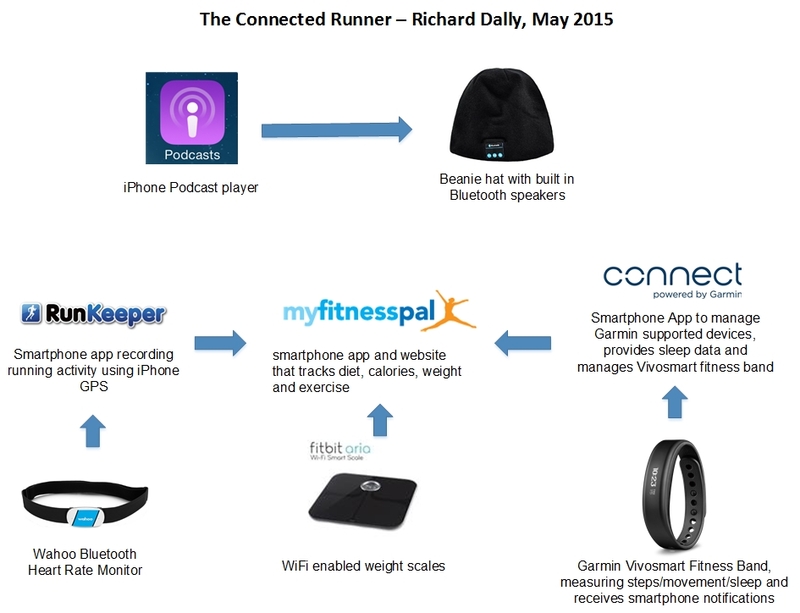 I now call myself The Connected Runner as I have embraced this new technology and seen the benefits through achieving weight loss, losing body fat and improving my cardiovascular fitness. The diagram above gives a brief insight into the main software, apps and equipment that I use currently. Over the next few weeks I will add some posts that describe how I use each item in more detail and show how being a connected runner helps with my training and my general health and fitness.